We’re pretty sure a lot of you still have a treasured Nikon F series camera lying around; today would be a great day to celebrate its place in the history of photography. As much as 2018 was an important year for Nikon with the introduction of the Z Series of mirrorless cameras, this year is also a big one for the company as the iconic Nikon F celebrates its 60th birthday. The first in the company’s highly successful line of professional 35mm SLR cameras, it was one of the most advanced cameras of its time when it came out in April 1959. To honor the Nikon F and its legendary successors on this special occasion, here are some key milestones that we believe are worth the revisit. Fun Fact: The Nikon F was born out of the technical difficulties with attaching longer lenses to rangenders. It wasn’t really conceived as professional anymore than their rangenders. The professional moniker was given to the F lineup when the company came out with less professionally targeted cameras. A quick-response, easy-to-use camera comparable to rangefinder cameras, with emphasis on automated operation. A system camera that can accommodate various photographic purposes through compatibility with a wide variety of interchangeable lenses and accessories. The development of a removable selenium photocell exposure meter with external exposure measurement, as a built-in design was perceived to be not sufficiently reliable. The exposure meter design, however, has to allow it to be fully coupled with both the shutter speed and aperture. The aperture ring therefore needed to be installed on the mount side instead of the front rim, and equipped with a claw for coupling to the exposure meter. The lens mount needed to have a large inner diameter to ensure compatibility with a wide range of interchangeable lenses. This would also produce a vignetting-free combination with long-focus lenses and fast speed lenses. A bayonet mount consistent with the placement of the aperture ring claw was adopted. This modular system camera is also noteworthy for having interchangeable backs, viewfinders (notably the Photomic prisms and a waist-level viewfinder), focusing screens, and other accessories. The Nikon F enjoyed unprecedented success, and became the camera that put the SLR camera and Japanese camera makers into the spotlight. It eventually became known as the first SLR system to be adopted and used seriously by professional photographers. While the Nikon F already came with a bunch of noteworthy features and functionalities, the company’s engineers set out to remedy some minor issues. These included an inconveniently placed shutter release button and a film advance lever that hurt the fingers. Two operating routes in the camera were also deemed outdated: the positioning of the mirror, and the shutter’s charging and driving mechanism. These affected the focusing and the accuracy of the shutter. 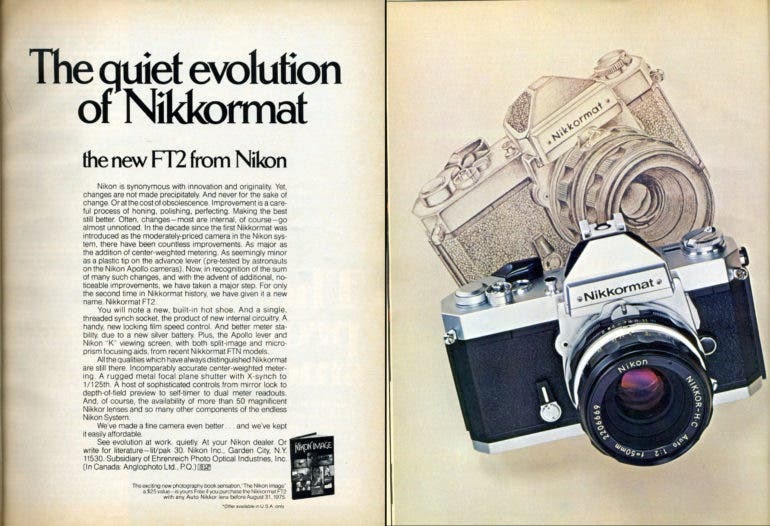 And so, the Nikon F2 was introduced in September 1971. It featured a completely new control system, a horizontal-travel focal plane shutter with titanium shutter curtains, a faster 1/2000 second maximum shutter speed, a swing open back for easier film loading, a larger reflex mirror to eliminate vignetting, a shutter release closer to the front of the camera, and an enhanced detachable motor drive. However, it was also relegated as Nikon’s last all-mechanical professional-level SLR camera, as the world soon became more interested in the electronic shutter. Since the Nikon F and the Nikon SP were developed at the same time, they were made with almost identical shutter mechanisms. 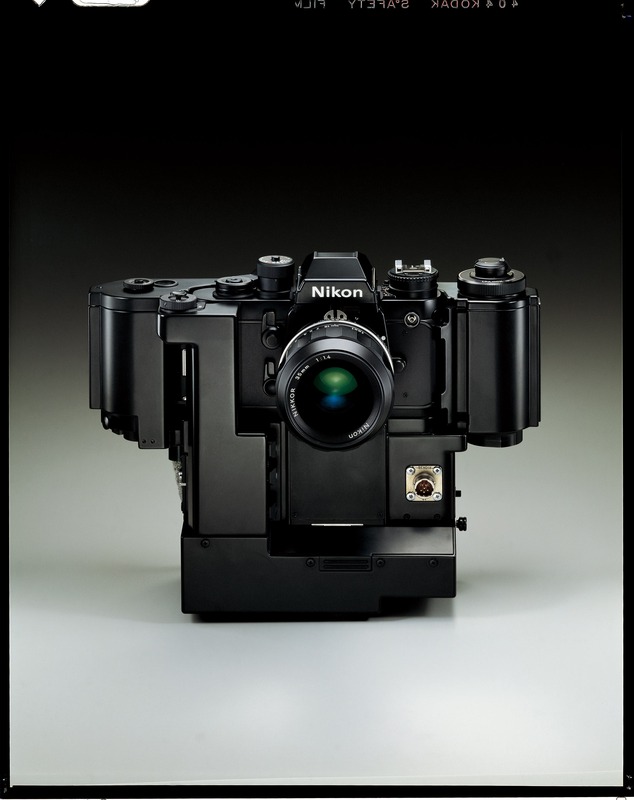 With the Nikon F, the major difference was the horizontally expanded shutter to make way for the mirror unit. A front curtain hook was added to link the shutter and mirror operations so the shutter curtain starts once the mirror reaches the “up” position. 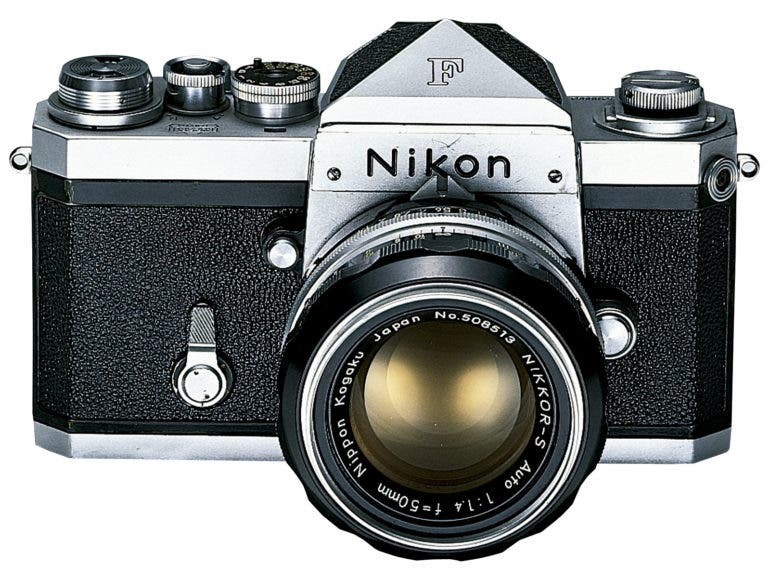 The Nikon F also had cloth shutter curtains like the Nikon SP, but the company soon completed the development of the titanium shutter curtains after the Nikon F was announced. With this, there was no more danger of the sun burning holes through the shutter curtains even if the camera was accidentally pointed at the sun directly. The Nikon F2 was notable for sporting a significantly modified shutter mechanism, with only the two titanium curtains inherited from the Nikon F. The shutter unit had lighter operating parts, the rotation was smoother, and the speed of the shutter curtain became faster and allowed for electronic flash use at 1/80 second. A silicon rubber damper was also installed, which was rare at the time. This improved mechanism was later adopted in the Nikon F3, F4, and F5. With the introduction of the Nikon F4, it became the first of the single-digit F-series models to use a vertical-travel shutter. The company opted for this shutter design so they could equip the F4 with the faster 1/250 second sync speed of the mid-range FE2 and the high-end F-801 models. However, since the F4 had a mirror-up mechanism, Nikon also needed to prevent light from leaking past the curtain blades and into the film housing. For this, they used multi-bladed curtains, while the anti-directional movement of the balancer absorbed the vibration resulting from the high-speed shutter curtain travel. The Nikon F5 was also given a vertical-travel shutter, but most of the shutter mechanism had a parts overhaul. These include shutter blades with upgraded epoxy plate with carbon fibers for extra strength and durability. The shutter brake was also improved. With these enhancements, the shutter balancer became obsolete. The development of the F mount. Metering technology: The Nikon FA had a new matrix metering mode. It had give segments then 9 segments and was considered much better than center weighted. Later it became the RGB sensors with the Nikon F5 which could identify artificial lighting easily. 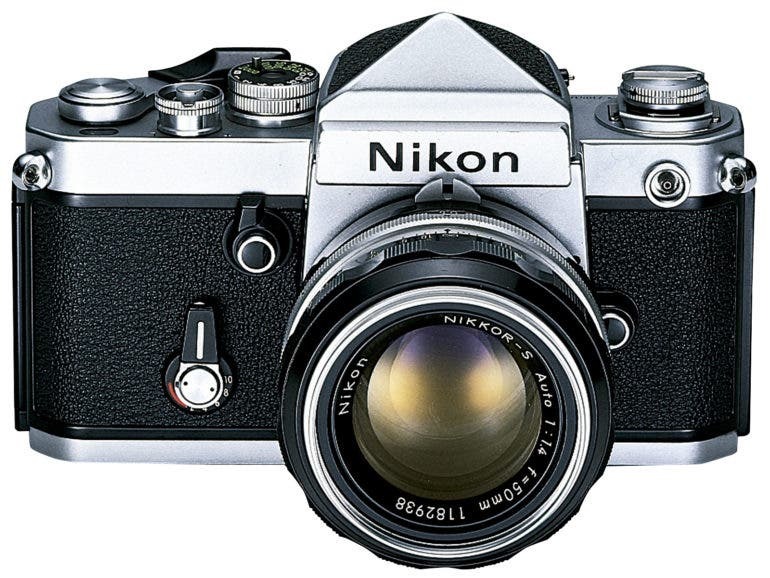 While it still employed the horizontal-travel shutter of previous models, the Nikon F3 was the first to feature the modern electronically controlled shutter, which was already the norm at the time. The goal of this new shutter mechanism was to showcase two advantages: automatic exposure (AE) and accurate long-time exposures. 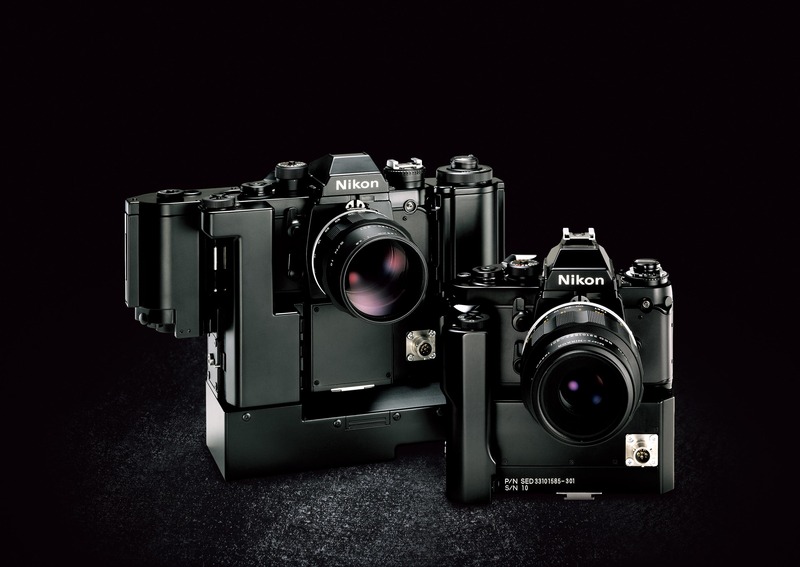 Nikon had initially attempted to incorporate these functionalities through the “EE Control Unit” Series that enabled shutter-priority AE, and mechanical long exposures through the self-timer. The motor drive is believed to be what set the Nikon F ahead of its contemporaries. The F36 Motor Drive and its direct-connecting cordless battery pack converted the Nikon F into an integrated one-piece automatic unit. 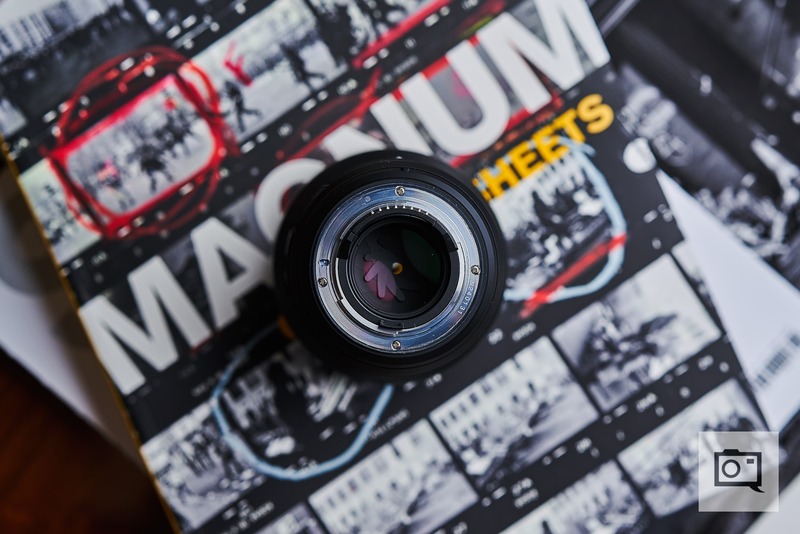 This made it popular among pro photographers for its mobility and promise of a new era in photography. While the noise eventually became a problem, the motor drive was still touted as a symbol of high class among veteran photographers. The F250 Motor Drive, with its special cassettes that hold up to 33 feet of bulk film, produces 250 exposures without the need for reloading. The F36 and the F250 also proved useful to many industries for many applications, including maintenance of scientific records. 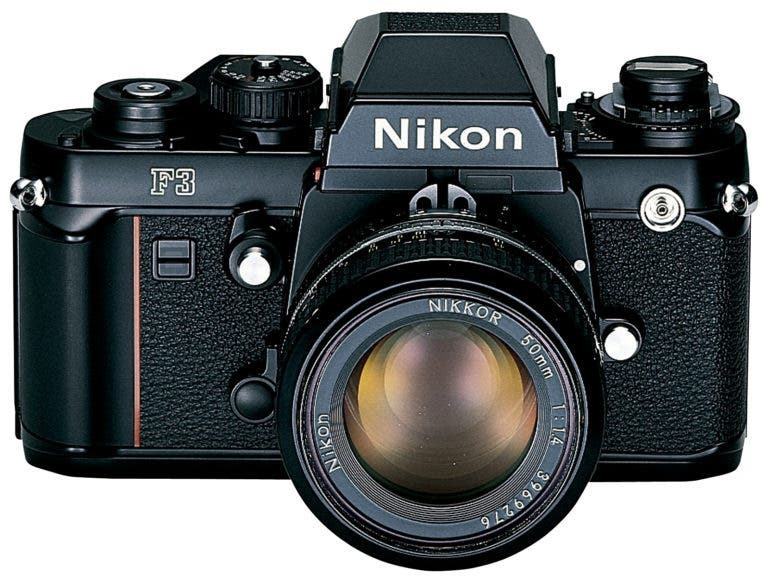 The third flagship model in the company’s professional SLR series, the Nikon F3 was introduced in 1980. It was first F-series model designed by Italian automobile designer Giorgetto Giugiaro. It was also the Nikon model that heralded a new era of automation in photography, earning the distinction of being a modern classic camera. It came in three variants: the popular F3HP or High Point camera which had the DE-3 High Eyepoint prism/finder, and its more durable titanium version called the F3T; the F3P (P for Press), designed for photojournalists, with added features like extra weather sealing, O-ring gaskets, MF-6 Auto Film-Stop Back, Type-B Matte focusing screen, and modified Titanium DE-5 pentaprism; and the high-speed F3H designed for press, sports photography, and the 1998 Nagano Olympics in Japan, and was the last specialized high-speed model made by Nikon. A rare variant called the F3AF, which was equipped with an autofocus pentaprism finder that allowed autofocusing using two special lenses: the AF-80mm f2.8 Nikkor and the AF-200mm f3.5 Nikkor. 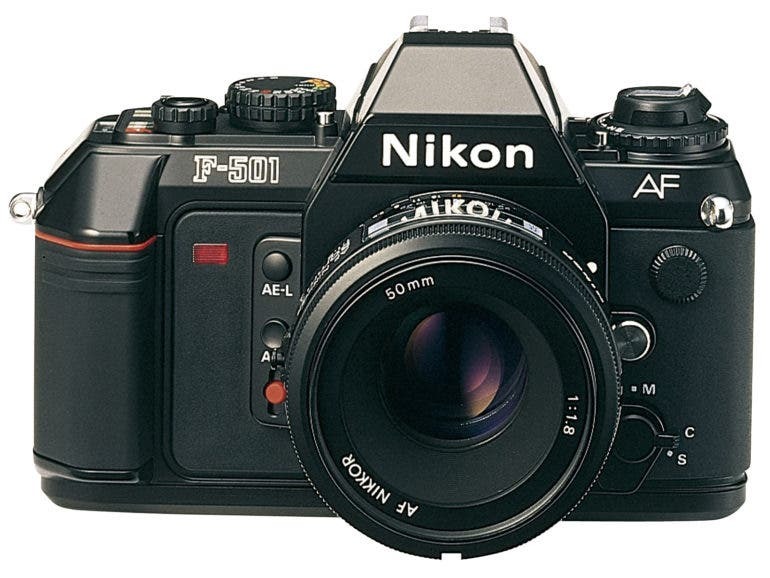 It was also Nikon’s first autofocus camera introduced in 1983. According to mir.com.my, a combination of factors can be attributed to its longstanding popularity. These include the the retained modular design, which allowed users to customize their setup using different accessories. Next is the new shutter mechanism, as mentioned earlier. The F3 was also the last to use a horizontal-travel shutter curtain, the last manual-focus pro-level 35mm SLR cameras by Nikon, and the last F-series camera without an integrated motor drive. Fun Fact: Weather sealing was a feature that was always kept mind but didn’t really start to become obvious until after the F and F2. The feature was specifically identified as a marketing advantage at the time of the F3. There was a special press version called the F3P. They went to extraordinary lengths to weather seal it. It had the high eye point finder with a hot shoe. But weather-sealed lenses came much later. They were weather-sealed before but they weren’t open about how much it was. It didn’t make its way all the way to the back mount until the 90s. NASA initially used 70mm and medium format films for their space missions in the 1960s, but they eventually needed a more portable option for more active shooting situations. For this, they commissioned Nikon to design a camera designed for vacuum, zero gravity, and other more demanding conditions. Nikon’s special product development team heavily modified the Nikon F to meet these requirements. The body was changed to a metal plate painted in matte black. Plastic parts were replaced with specialized materials. 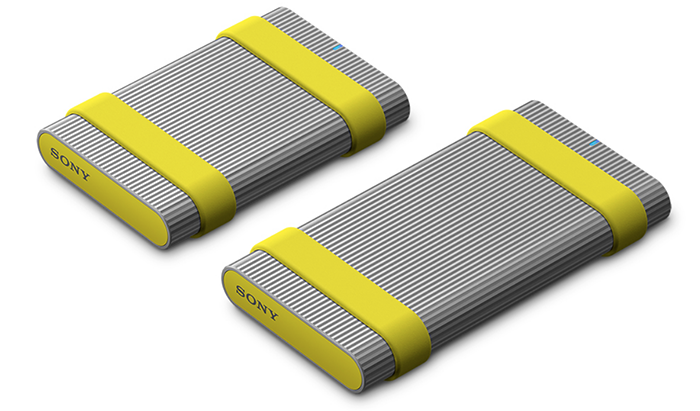 The battery chamber was designed to prevent leakage. Operating parts were altered to have a larger finger pad on the film advance lever, a larger rewinding knob, and enlarged counters and windows. Even the interchangeable lenses were also modified. These stringent requirements gave birth to several NASA Nikon F models, such as the Nikon Photomic FTN used in the Apollo 15 mission, and a motor drive-equipped Nikon F used aboard the Skylab. Later, Nikon also used the F3 as a basis for the motor drive-powered “Small Camera” and the “Big Camera” for bulk loading with special long film in 1981. 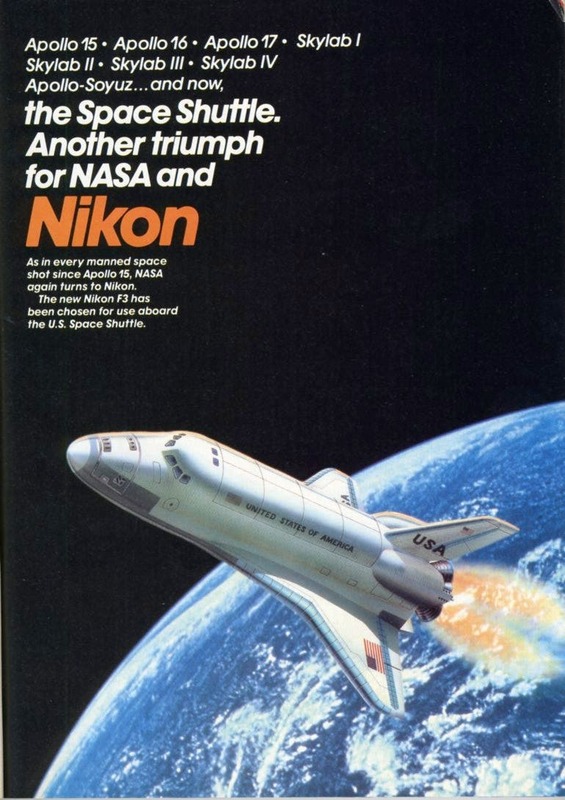 A modified Nikon F4 was also delivered for NASA, with only a few small differences between the space model and the commercial F4 models. 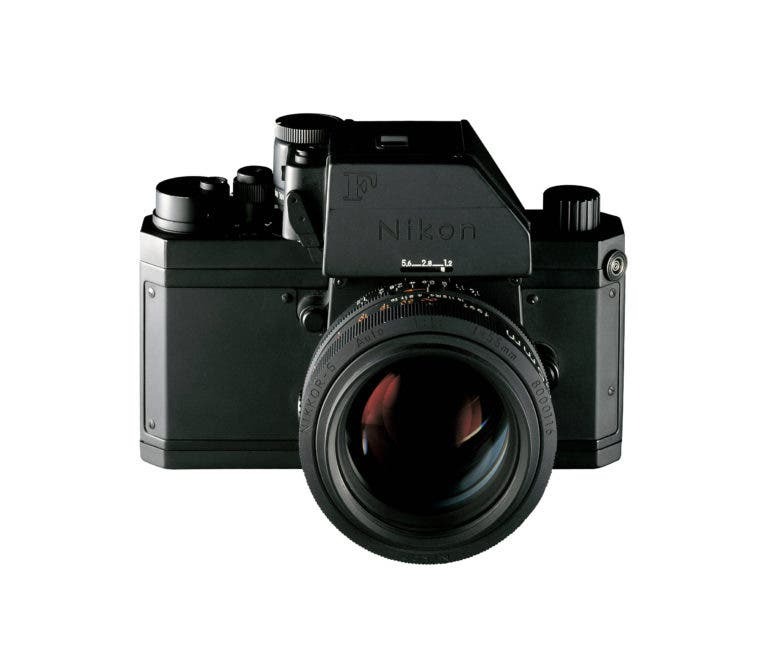 The so-called Nikon NASA F4 Electronic Still Camera also holds the distinction of being among the first and rarest fully digital cameras, as it was also equipped with a digital camera back with a 15 x 15mm monochrome CCD image sensor. The Nikon F-501 isn’t part of the F series of professional SLR cameras, but it actually played a role in the development of the Nikon F4. Also called N2020 in North America, and introduced in 1986, this high-end model was the company’s first successful autofocus SLR camera. It also had a built-in motor drive for automatic film loading and advance, a feature first seen in the F-301 (this model’s manual focus version). Apart from its outstanding features, the F-501 also sported a different look compared to previous models. The black polycarbonate body instead of metal was one obvious change; another is the extended grip on the shutter button side. However, it also borrowed the red stripe that first appeared in the F3, but placed horizontally instead of vertically. 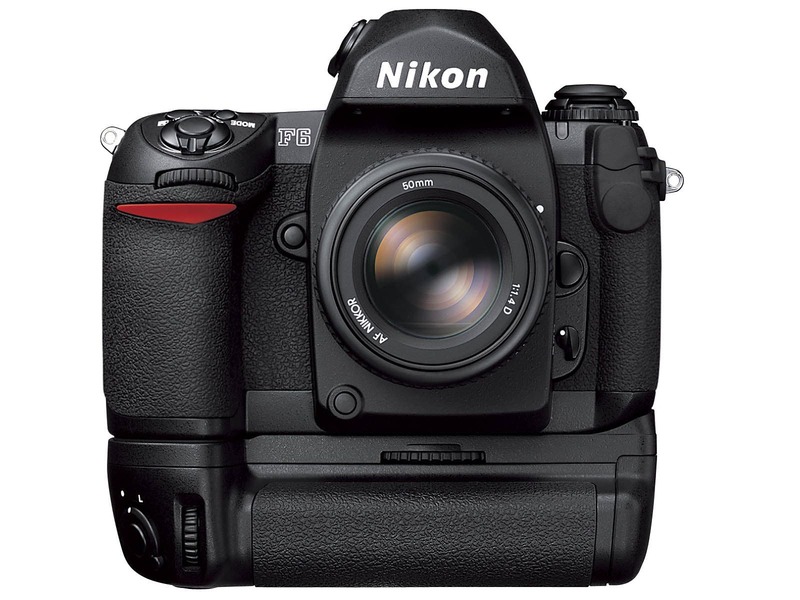 Nikon lifted some of the design concepts from the F501 to the F4, its first professional autofocus SLR introduced in September 1988. 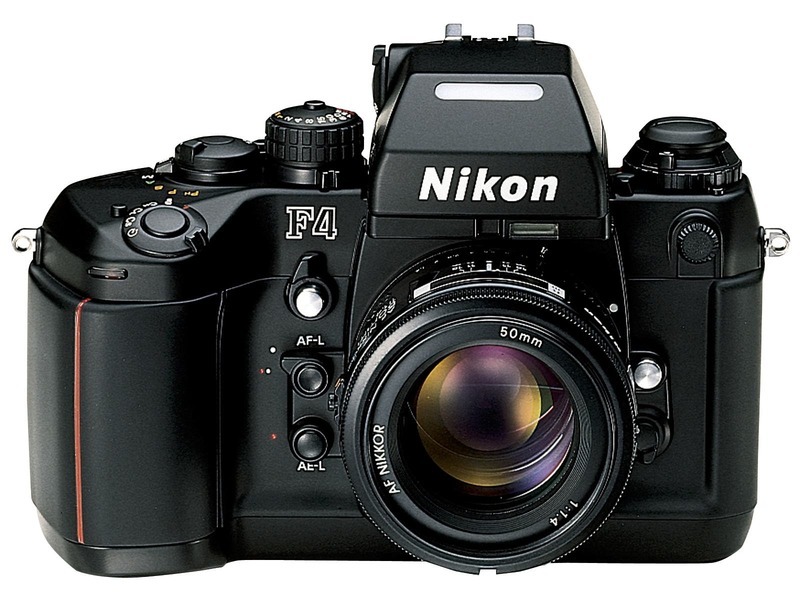 The fourth flagship model in its F series, the Nikon F4 was Nikon’s first professional SLR to have a practical autofocus system. 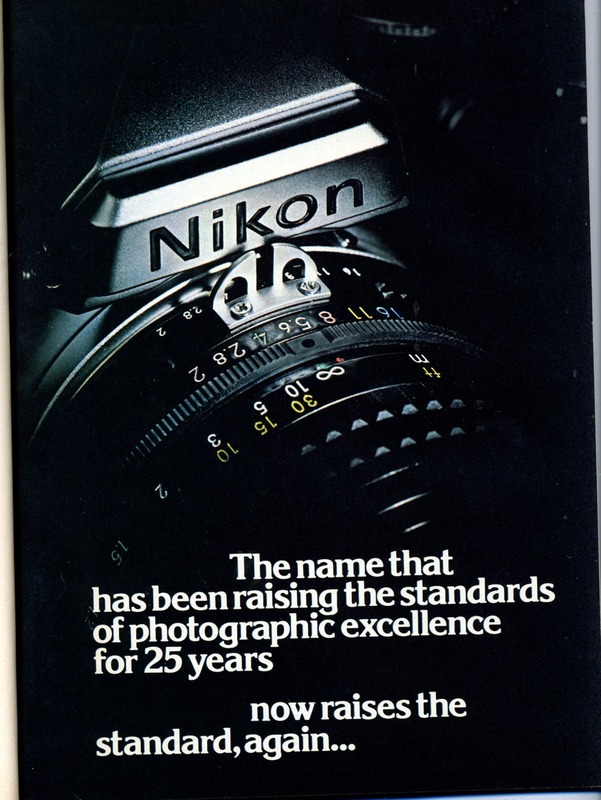 According to Nikon, it was a “joint product of Nikon and its customers” in the sense that it was largely developed with customers’ requirements in mind. Essentially, they wanted an F3 with the faster flash sync speed of 1/250 second (found in high-end and mid-range models, as earlier mentioned), and a convenient and reliable matrix metering system like that seen in the advanced amateur-level Nikon FA. With the addition of the motor drive, it also became the first F series model to have a motor-driven film advance, but also still offered manual film rewinding. Thus, the F4 was seen as an effective transition model from mechanical SLRs to the professional film and digital SLRs of the future. While its electronics, LCD viewfinder display, autofocus, matrix metering, and programmed auto-exposure were cutting edge, it also kept some of the classic analog dials for shutter speed, aperture, metering pattern, and exposure compensation. Now, we’ve come to the Nikon F6, the latest model of the top-of-the-line F series that came out in 2004, but is still in production and remains one of the priciest film SLRs you can grab today. 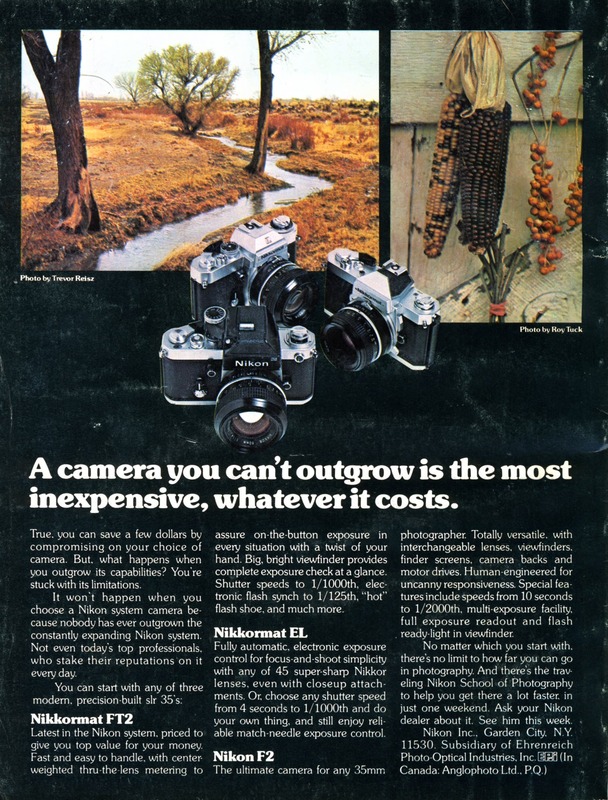 Nikon calls it “the preeminent film SLR camera” created at a time when digital photography essentially took over 35mm film for professional use. The company must have thought, what better way to mark the end of an era than to craft the ultimate film SLR camera? So, they gave the last F series model and the rest of their film SLR cameras a big send off. They equipped it with an Advanced Exposure Metering System with 3D Color Matrix metering and improved algorithm, and a flexible Center Weighted metering and Spot metering corresponding to any of the 11 selected focus areas. Its autofocus system includes the Multi-CAM 2000 Autofocus (AF) Sensor Module with 11-area AF system and 9 cross-type AF sensors, plus Four AF Area Modes. It can accommodate all Nikon lenses made since 1977, including those all the way from 1959 if AI converted. It has five shooting modes: Program, Flexible Program, Shutter Priority, Aperture Priority, Manual, and also allows for exposure compensation and Auto Exposure/Flash Bracketing. It has four film advance modes: Single (S), Continuous Low-Speed (CL) for up to approx. 3 fps, Continuous High-Speed (CH) for up to 5.5 fps (or 8 fps with optional Multi Power Battery Pack MB-40) and Continuous Silent (Cs) for nearly silent operation at approximately 1 fps. In short, it’s a beast of a film SLR camera, with all the advanced features you could probably ask for as a film photographer crammed in there. “With a digital camera, the number of pictures you can take is infinite, in the sense that there is no limit in the number of shots to take, unlike shooting with film. You don’t have to hesitate when taking pictures. Just release the shutter, although later, you may find that you don’t want to keep the results. “But, on the contrary, some photographers reject the prospect of such ease, as they desire a more careful, rigorous approach to taking pictures. 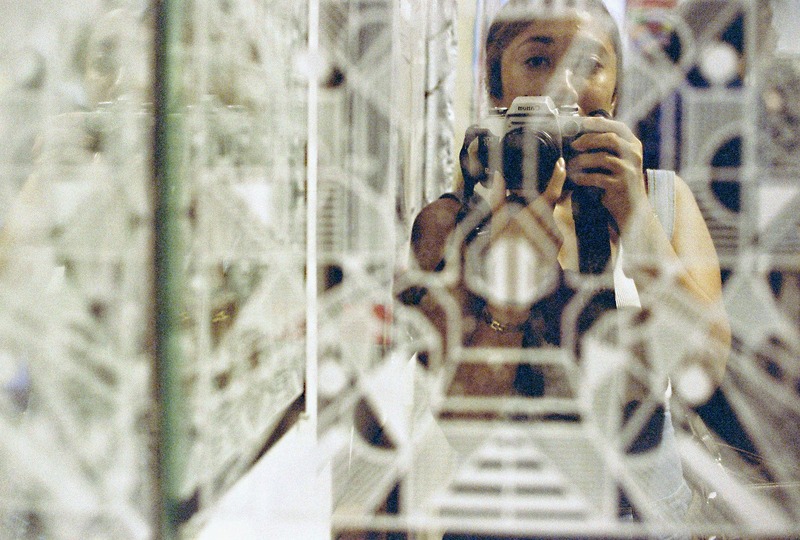 They want to treasure each picture-taking opportunity by etching their vision on film. 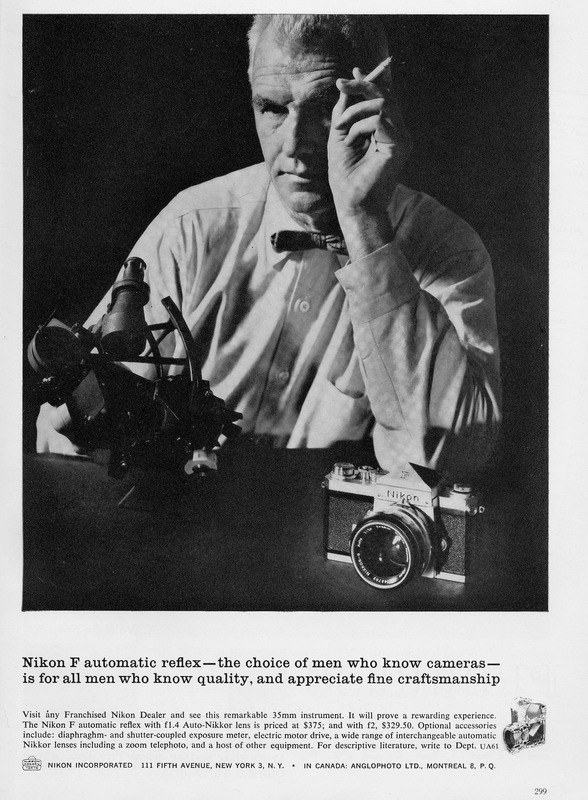 The Nikon website, where much of the materials for this article were sourced, is a treasure trove of information on the colorful history of the company. So if you’d like to find out more, we invite you to check out their Corporate History. Oh, and lest we forget, Happy 60th Anniversary to the iconic Nikon F! All images of cameras provided by Nikon and used with permission. Input for this article was given by Steve Heiner over at Nikon. Additional work was provided by Editor in Chief Chris Gampat. All advertising images provided with Creative Commons Permission of Nesster.